Now that my dining room is clear of all the yard sale stuff that had swallowed it over the last few weeks - I can finally see my table again. That inspired me to decorate our large dining room table for fall. If you follow along 2IY often you might notice a trend - I tend to shop my house before I shop anywhere else. That's exactly what I did for my fall table decorations. I started with the table funner. For fall, I wanted something a little earthy and rustic. 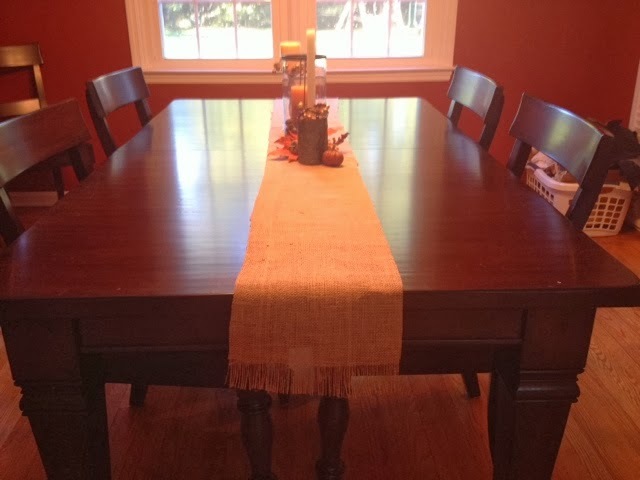 I have been doing a lot of burlap crafts lately so I cut a piece of burlap long enough that it would slightly hang over the side of the table. Then I pulled out about 10 or 12 strands of the burlap on each end to make a fringe. From there I just started adding and rearranging pieces one at a time. I started with the large the glass candle holder. I filled the bottom with pinecone-looking pieces that I took out of some potpourri before adding the two tone (once three-tone) candle. The white candlestick was a thrift store find that I had spray painted and used on the mantle for awhile. To add a little color I put what looks like a mini wreath around the bottom - it's actually a napkin ring and I actually have them all over my house. Shhh...don't tell anyone I'm using napkins rings to decorate. To balance that candle stick, I added one of my tree branch candle sticks on the other side. I love these candlesticks especially for this time of year, they really bring the outside in. As you can see, there's another napkin ring. To fill in between the candles, I added a few leaves and pumpkins that I had leftover after updating my front door fall wreath. They provided some color and texture and really completed the look.